What you know about your customers and how you use that information will dramatically affect your sales success. Customer Relation Management is a strategy for collecting, organizing and using information about your customers to better connect with them. The rub, of course, is that proper CRM takes a lot of time and work. And when sales staff is busy, the first thing that often falls through the cracks is the inputting or retrieving of key information on customer activity and issues. With Voicent Live's automated CRM capabilities, you will automatically track and manage all of your contacts across phone, text, email, social and web channels. There's no need for busy staff to remember to note that an important customer called. It will be noted and recorded on that customer's CRM profile automatically. Voicent Live lets you design customer profiles and contact histories with customizable fields and display options, but day-to-day management, such as tracking a customer's preferred method of contact, or opt-out requests, are all handled automatically, without burdening your busy staff. When your CRM data is rich and up-to-date, you'll be able to easily create, deploy, and manage online campaigns that increase revenue. What good is excellent customer information if it is rarely used? 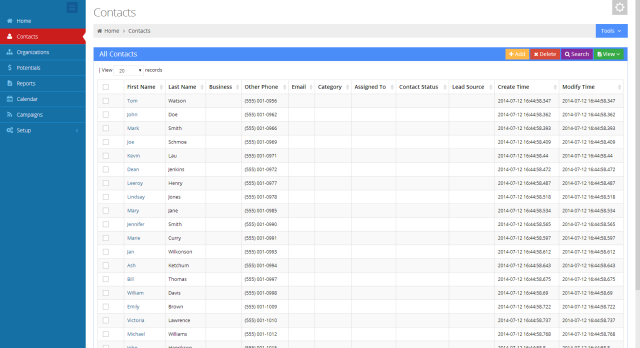 With Voicent Live's automated CRM capabilities, your agents, sales reps or call center operators will automatically get a pop-up display of a customer's CRM profile anytime they connect with that customer. That means your company will be in an excellent position to deliver sterling customer service, or close a sale, everytime it connects with customers. During that contact, your agent will be able to note special requests or other important details that will be automatically saved at the end of the call. Having quality information about your customers and prospects can make for much smarter sales campaigns. With a few mouse clicks, you will be able to segment campaigns based on previous purchases, geography, expressed interests, or any characteristic detailed in your CRM profiles. Voicent Live's automated CRM capabilities include robust reporting features that allow you to communicate customer trends to inform organizational and product development decisions. Now your sales and marketing teams can work hand-in-hand with the rest of your organization to improve customer satisfaction, increase sales and improve the bottom line. Whether you are just starting out or already have an existing CRM database in place, Voicent Live CRM is easy to integrate into your business. Simply import any existing contacts into Voicent Live's CRM and you are all set. Create a personalized auto dialer broadcast or start a predictive dialer campaign, all from within Voicent Live's CRM tool. Design and manage sales and marketing campaigns based on location, buying preferences, sales activity, purchasing history or other differentiation. Help your organization identify and better understand customer needs by keeping track of customer interactions and displaying them when they're needed to make a difference.